This dish will make you feel alive! The invigorating combination of fresh cilantro, sweet pomegranate, and spicy jalapeno will make you want to dance. Dice the onion. Squeeze half an orange over the onions. Mince the 2 jalapenos and garlic as finely as possible. Toss the salt, jalapenos, and garlic with the onion and juice mixture. Dice the tomatoes and mix in with the mixture. Chop the cilantro and add to a bowl. Mix all the ingredients together with a gloved hand, crushing the ingredients together to mingle the juices. 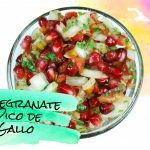 Add in the seeds of one full pomegranate and gently mix the salsa.